The Uniseal Cryogenic Stainless-Steel Pipe Coupling allows for leak-tight sealing, with pressures up to 2,430 psig, and a temperature range as low as -325 degrees Fahrenheit (-198 Celsius), for warm gases and liquids, and atmospheric cryogenic elements as low as liquid nitrogen, oxygen, argon, and LNG temperatures. Most ground joint-pipe couplings consist of a metal-to-metal seal. During installations, such seals can suffer scoring damage on the lapped seats, causing costly leakage which requires the entire union to be replaced. The Uniseal Pipe Coupling's leak-tight sealing solves frequent leakage issues, intensive maintenance, and stocking difficulties associated with standard ground joint-pipe couplings. Forged of ASME/ASTM SA-182-F316L stainless steel, the Uniseal Cryogenic Stainless-Steel Pipe Coupling's assembly is equal to MSS-SP-83 for pipe unions: socket weld or threaded ends with an easily replaceable Spiral-Wound gasket, which provides a leak-tight joint and seal. 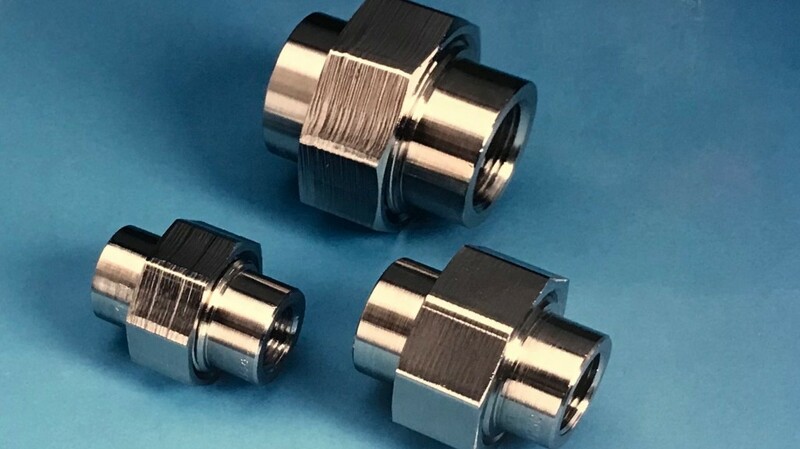 Similar in principle to flanged joints, this field-proven design provides a lower component cost alternative to flanges or bayonet connections. The easy-to-install Uniseal Cryogenic Stainless-Steel Pipe Coupling with interchangeable components is now available in 1/2" thru 2" pipe sizes.